Cheese filled pasta in a cheesy tomato sauce. 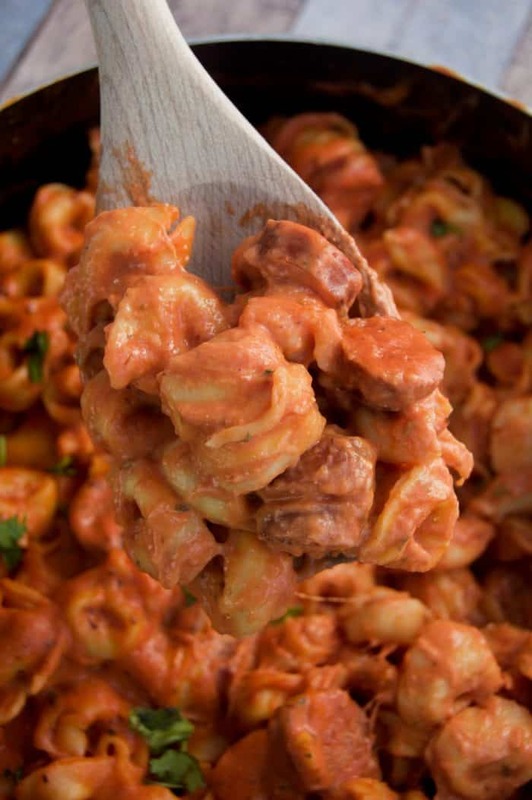 This Tortellini and Sausage is one my family’s favorite meals, even the kids ate up this recipe! Things change in the kitchen after being a mom. My boys are pretty good eaters but they have their picky moments and food they just will not eat. I have a few tricks up my sleeve that usually work with them though. Dip and cheese! Letting them dip in ketchup or adding cheese to something usually wins them over and they end up trying new food that way. Since this Tortellini and Sausage dish is filled with cheese and the kielbasa look like hot dogs it quickly became a winner with my kids! It’s now one of my favorite Family Friendly Dinner Recipes. You can use any tortellini you enjoy we just used a three cheese tortellini. I started by cooking it according to the package directions then setting it aside while I worked on the sauce. To make my sauce creamy and cheesy I added cream cheese to it with the seasonings. Once it was all cooked and shimmered I added the tortellini and shredded cheese to melt in with everything. It was perfect! I topped mine (not the kids because well it’s green) with some fresh diced parsley just for a garnish. Cheese filled pasta in a cheesy tomato sauce. 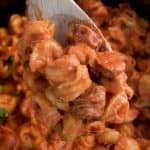 This Tortellini and Sausage is one my family's favorite meals, even the kids ate up this recipe! Cook tortellini according to package directions, drain and set aside. In a large pot cook diced kielbasa, garlic, and onion for 2-3 minutes. Add tomato sauce, cream cheese, and Italian seasoning. Add cooked tortellini and allow to shimmer stirring occasionally for 10-15 minutes. Add shredded cheese and mix until cheese is melted. If you enjoyed this recipe make sure to stop by The Diary of a Real Housewife for even more like it!